This program is a casual game with the purpose to pass time via spawning and handling custom created entities on your Desktop. Therefore you will be provided with a set of tools. As a developer you can also create your own tools using AngelScript. Available tools are selected via the ingame menu. New tools can be viewed and downloaded via the ingame menu, too. You can also view/upload taken screenshots during gameplay (uploaded screenshots are available via the official game website). The following basic steps are required to create a tool. Create a new folder inside the tool directory and name it according your tool name. Grab the demo_sdk.as script file, copy it inside the directory and give it the same file name as the directory is named. Casual Desktop Game is now on Steam! The game is not yet published on Steam, but you can view the shop page already, as it is still in "soon available" state. It might be fully available in about three weeks. I hope you guys like it and have fun using it. For those who don't know what CDG is: It's a remake of the ancient Desktop Destroyer with the difference that you can create your own tools via AngelScript and download new tools from the Workshop. Read more about version 0.7 of Casual Desktop Game. A new version has been released and with it comes a laser mech entity. 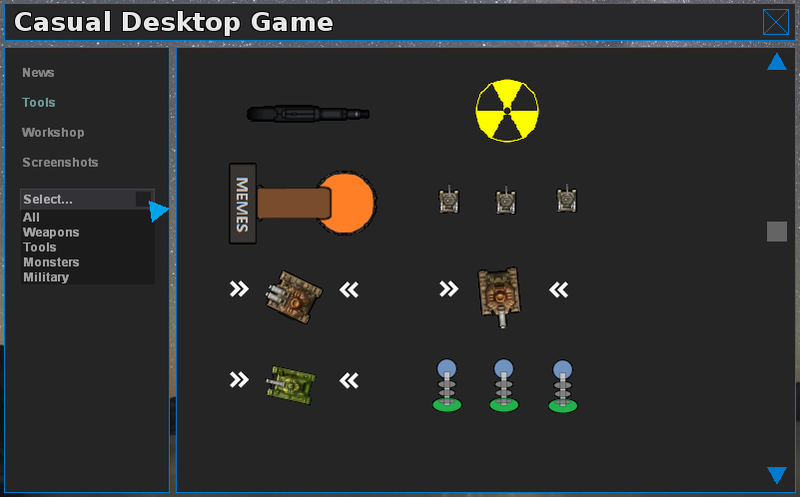 Today a new version of Casual Desktop Game, the Desktop Destroyer remake, has been released. Thanks I will test it as soon as I can. I hope you get the motivation for the project back someday, although I thank you for what you have already achieved. Have fun and good luck :). Besides the previously mentioned things I don't know what further stuff I could add. Maybe just a bunch of new tools? Sadly the game isn't compatible with windows 7, as at least uses some win32 6.2 instructions, for example this one: "RtlPublishWnfStateData" Which introduction was on Windows 8 (NT Kernel version 6.2). Thank you for your interest in this small project. Yes, I'm aware of the problem, but just didn't fix it until now. I will fix it in a few days. I just don't have time to do it at the weekend, so I will release an update during the next week. I'm also having "Can't find entry point for D3DKMTGetMultiPlaneOverlayCaps procedure in library ..CasualDeskGame\d3d9.dll" in windows 10 x64 (10.0.14393 in case W10 Build is necesary), although renaming the "offending" dll and using system one makes the game run. As far as I tested the game, it looks really promising, although decals reduce fps too much. Last but not least, I want to ask you if you prefeer me to report this on github game's page as issues, as I would gladly do it there instead. Again have fun and good luck! Oh, ok. Thanks for the hint. I just wanted to provide D3D DLLs just in case they are missing, but I'm glad that it works without the DLL.^^ I guess there is no need for it anyways, since D3D9 should be installed on any system starting at Win7. Thanks for the feedback. Yes, if there are too much decals the FPS drops are quite high. Need to have a look at that issue as well. Yes, you are very welcome to post the issues on the GitHub page. This project really looks promising, had tons of fond memories from the old desktop destroyer game back in XP-days, and I'm sure this one will deliver even better ones. Right now the only thing I'm missing is a x86 compilation, so I can enjoy this raw jewel in old x86 CPUs. I hope this request isn't a hassle to comply, and thanks in advance in any case. Thanks for the effort put into this, and good luck with the project.